The challenge was kicked off by Mix 93.8FM presenter Roxy Blows in April this year. She bravely faced her fear of heights and completed the #WildSlide across the breath taking Oribi Gorge where she was suspended 55 stores above the ground. As Roxy earned her bragging rights, she challenged the next two celebrities who are both world renowned celebrity comedians Jason Goliath and Warren Robertson to take part in the #WildSwing activity. 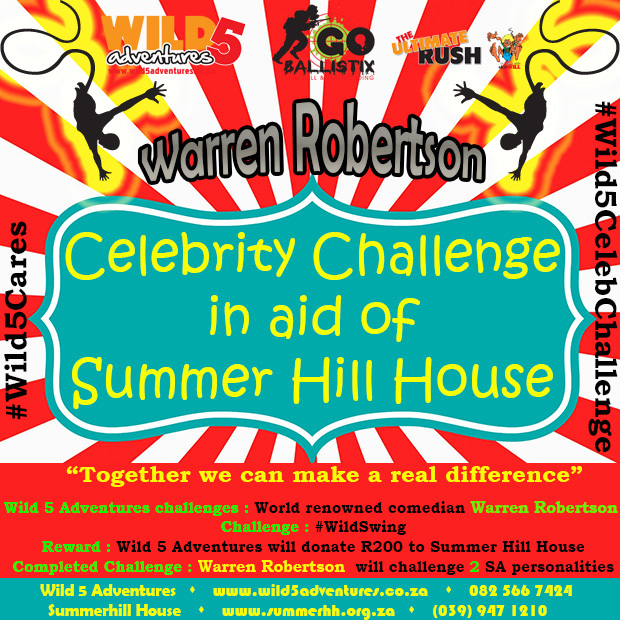 Jason Goliath took part in the challenge earlier this month, and over the weekend (20 June 2015) Warren Robertson earned his bragging rights all in an effort to raise much needed funds for charity. As Warren completed the #Wild5CelebChallenge and earned his bragging rights, he has nominated comedian Deep Fried Man. Next in line for the #Wild5CelebChallenge is local KZN based Jem Atkins, who will be taking part in the #WildSwing on Wednesday 15 July.